Bring the rustic charm of an antique park bench into your home with this gorgeous, natural reclaimed oak and weathered iron seat. 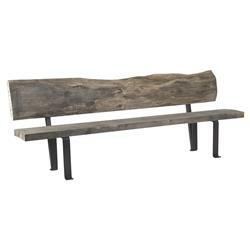 The oversized wood bench seat and back look as if they washed ashore at your favorite beach and were crafted by a local artisan into this beautiful piece. It adds ample seating and elegance to an entryway, sitting room or den. This item is made to order; please allow 3 - 4 weeks lead time for production.